From 1908, a fine violin recording of Schubert's Serenade played by Charles D'Almaine. Announcement "Violin Solo, Schubert's Serenade played by Charles D'Almaine. Edison record." Schubert's beloved Serenade from his 1828 Schwanengesang ("Swan Song") was well suited for early recordings as its performance could fit on a two-minute wax cylinder. This particular recording is likely a 1908 re-make of Edison's original 1899 brown wax arrangement. 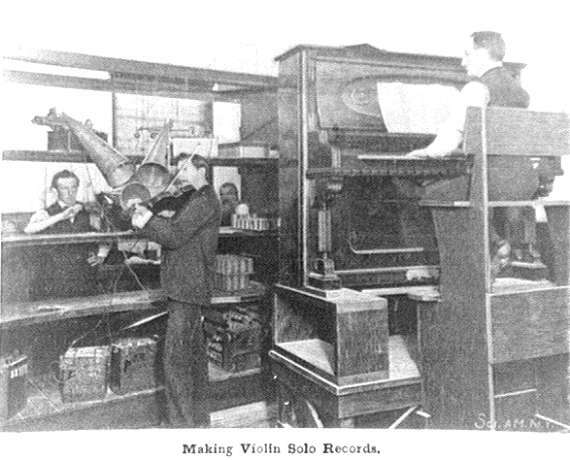 To see a photograph of violinist Charles D'Almaine recording a wax cylinder, click here. In the photo, D'Almaine could easily have been performing Schubert's Serenade (to see more, click here).